Follow this link if you want to know more about solenoid valves. 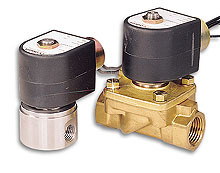 Two-way solenoid valves cover most industrial laboratory applications. A two-way valve controls the flow of fluids through a single passage. It has two ports, an inlet (1) and an outlet (2). A normally closed valve does not pass fluid unless it is energized. A normally open valve operates in the opposite manner. Wetted Parts: SV-100 Series: stainless steel, copper and seal; SV-200 Series: brass, stainless steel, copper and seal. 3-WAY CONTROL A three-way valve is normally used to control larger values; it has an inlet port, an exhaust port, and a common cylinder port. 4-WAY CONTROL A four-way valve has an inlet port (1), two cylinder ports (2 and 4), and two exhaust ports (3 and 5). They are generally used to control double-acting actuators. Wetted Parts: SV-200: brass, stainless steel, copper and seal (SV-242 Delrin additional) (SV-271: aluminum, Delrin, stainless steel, copper, and seal) (SV-281,-282, FKM additional). Nota: All SV100 and SV200 sereis valves are 110 Vac powered. For 220 Vac power purchase replacement coil separately.